OK, folks, if you haven't been to this site before, be prepared for the brutal truth about what happens when your guns and means of self-defense, and the defense of Liberty are given up or taken away. This is a collage of data available elsewhere on the web, bringing the easily understood bare facts together!!! All You Squeamish Bleeding Hearts -- Pay Attention!!!! Puke or pee your pants if you must, but Pay Attention!!!! Well over 56 million innocent civilians have been murdered, and billions have been "neutralized" in fear of brutalization by their governments this last century as a result of "Gun Control" laws..
Are you considering backing gun control laws? Do you think that because you may not own a gun, the rights guaranteed by the Second Amendment don't matter? and Armed robberies are up 44%. In that country's state of Victoria, homicides with firearms are up 300%. Over the previous 25 years, statistics had shown a steady decrease in armed robberies and Australian politicians are on the spot and at a loss to explain how no improvement in "safety" has been observed after such monumental effort and expense was successfully expended in "ridding society of guns." It's time to state it plainly; guns in the hands of honest citizens save lives and property and, yes, gun-control laws only affect the law-abiding citizens. Take action before it's too late, write or call your State and Federal Representatives and Senators. It ain't about controlling guns in the hands of criminals, folks, it is about CONTROL of you and me by the REAL CRIMINALS - The International Oligarchy!! ULTIMATE CONTROL!! 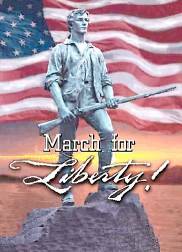 Defend Liberty and the Constitution for the United States of America and the Second Article of Amendment! Your very life depends on it!!! The 1938 Nazi Weapons Law that disarmed, enslaved and ultimately "terminated", i.e. murdered, the men above, is alive and well in the United States, and is called "The Gun Control Act of 1968", and is enforced by a modern day Gestapo, known as the "Bureau of Alcohol, Tobacco, and Firearms (BATF) SWAT Teams." 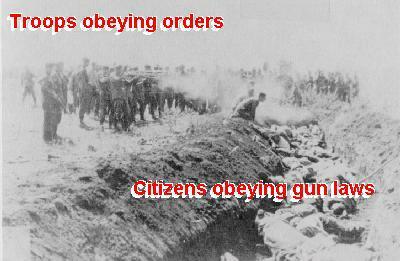 But as we all know, "They are just following orders." 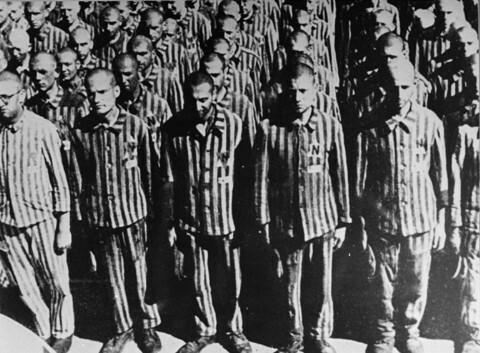 Notice that the men were not all white nor were they all Jews. They were just like you and me!! Fathers, Sons, Brothers, Husbands, Lovers Of Those Women!! and I didn't speak up, because I wasn't a trade unionist. And in 1993 they went to Waco. And all across the land. Who Will Speak Up For YOU now in 2008 and in the future?? Where do you stand??? Have you drawn the line??? Will you live free or enslaved??? Gun Control -- The KEY to GENOCIDE!!! As for me, I choose LIBERTY AND FREEDOM, to DEFEND The Constitution and the Republic against all enemies, Foreign and DOMESTIC !!! The Second Article of Amendment to the Constitution for the United States of America Stands as the Guarantor of All other Rights and of the Defense of the Constitution itself. I suggest you digest this page - The Tripwire - What would be the tripwire resulting in open rebellion? See also "WHY AN ARMED CITIZENRY?"